THR brought their B-Spec Fit, equipped with a kit developed specifically for Rally competition by Honda Performance Development, to the second round of the Rally-America National Championship. The B-Spec Rally Fit started the 2013 season with a win in the B-Spec Championship at the Sno*Drift rally. “We were excited to get the season started with a win, and also to make it through the challenging snow and ice event without any issues,” Robinson said prior to traveling to the 100 Acre Wood Rally. Based on the experiences from 2012, the team was hopeful to repeat its success in the fast gravel event held in Missouri. The day prior to the start of the event, a large snow and ice storm pummeled the region, changing the smooth, fast gravel roads into a challenging mix of mud, snow, and ice. Compounding those issues was the fact that the team didn’t have the right tire to tackle the icy roads. “We’ll have our work cut out for us this weekend. Our goal is to make sure we don’t take ourselves out of the race!” stated Jordan Guitar, co-driver for the Fit. Starting out cautiously on the icy roads, the Fit was able to build up a 30-second lead over the other production-based Ford Fiesta. “We were just trying to keep on the road through today. The roads are especially challenging with a gravel tire!” James explained at the end of Stage 7. As expected, conditions became treacherous again for cars not running dedicated snow tires, and the B-Spec Fit had to back off the pace. Finally, the B-Spec Honda Fit was able to claim victory in the second round of the 2013 B-Spec National Championship, and narrowly hold off the other 2WD production-based cars. “The Production Fiesta was charging hard after us in the last three stages of the event,” a relieved Robinson recalled after the victory. “We were happy that we could hold onto our position at the end of the event. My name is Corey Fergus. I race the #197 Honda Civic Si for RSR Motorsports in Grand-Am’s Continental Tire Sports Car Challenge. 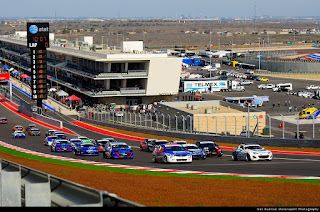 The second race of the season for the CTSCC was at the new Circuit of the Americas (COTA) track in Austin, Texas. This was easily one of the most anticipated races of the season as ours was the first race on the circuit since the Formula 1 race back in November. To be racing on the same track and standing where some of the world’s best drivers were was pretty cool, to say the least. Only test days had been held leading up to our race, so not very many drivers had been to the track before. Therefore, there was a relatively level playing field entering the race. The first day, most people had quite the learning curve. For me, it took four laps and I was second fastest. 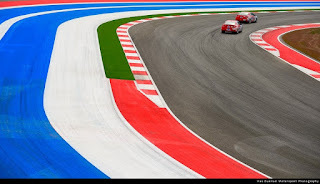 Normally, I prepare for a race track I’ve never been to by using iRacing, an online-based simulation where tracks are laser scanned for 100 percent accuracy. COTA is too new for iRacing, so I resorted to other methods. Just like studying for an exam in school, studying a track before you compete on it is key to passing the test or being successful. I watched as many YouTube videos as possible and purchased the F1 2012 video game for Playstation 3. Since I couldn’t do laps in person, I did as many as I could in the game. When I got on track for the first time in practice, I knew exactly where I was going and it didn’t take long to get up to speed. Qualifying went well. I put our 2011 Honda Civic Si on the outside pole by 0.048 seconds. So close! The race went equally as well. I quickly moved into the lead and led more laps (13) than any ST driver in the field. I pitted in the lead and handed the car over to my co-driver, Owen Trinkler. After a penalty on the pitstop, Owen worked his way back from 18th to finish fifth. After a 12th-place finish at Daytona, this put us fourth in the championship standings. Consistency, among other factors, is what wins championships. We need to keep finishing well. Not only had our team never been to COTA, but we also brought out the second new Honda Civic Si of the season. Out of the three cars RSR Motorsports is running, two of them are new 2012 Hondas. My Honda is the only 2011 in the series. We plan on making the switch soon for my car. The older car is working great, but I look forward to getting behind the wheel of the new Honda Civic as well. It’s comforting, knowing that HPD is there to help and support us as we convert to the newer cars. 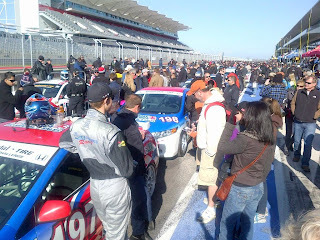 Overall, the COTA weekend went very well. We collected very valuable points towards the championship for ourselves and helped Honda move to third in the Manufacturers’ Championship, as did the #75 Compass 360 Honda Civic (Eversley/Gimple) with a sixth-place finish. They now lead the championship. Although we’re all competitors, it is always nice to see other Hondas running well. After all, we’re trying to win the team, driver, and manufacturers’ championships. The track was fantastic and fun. It was truly an amazing facility and I am grateful to have had the opportunity to race on such a prestigious circuit.